The Big News: The second annual Dusty Rhodes Tag Team Classic was announced and the show saw several teams state their intentions on becoming the tournament champion. The Medium News: Samoa Joe finally lived up to his threat from last week, but what he did was attack two people you've never heard of before their first TV match. The Little Beaver Sized News: Hideo Itami beat Lince Dorado in a very good main event. The show started with William Regal standing in an empty arena and announcing the second annual Dusty Rhodes Tag Team Classic, with the finals being held at NXT TakeOver: Toronto. He also stated that the brackets will be released on Twitter and the first round matches will begin next week. It is a 16-team tournament, won last year by Finn Balor and Samoa Joe, which was actually the start of their 10-month storyline. We kick things off with the Perfect 10 facing Angelo Dawkins. Dawkins has lost the vast majority of his televised matches over the last few years, while Dillinger has gotten closer and closer to an actual winning streak lately. Remember how I have been saying that I didn't think people cared so much about Dillinger as much as they liked chanting 10? Well I may not be able to say that much longer, as the fans are starting to like him more and more. Dillinger picked up his second straight win with the Tye Breaker in a short bout. Glorious! As Dillinger started walking away, out came the most glorious superstar in NXT history, Bobby Roode. He congratulated Dillinger, but said he's not a 10 yet, however with the proper guidance he could be. He said the number one reason he came to NXT was to win the Dusty Rhodes Tag Team Classic. That seems like an odd reason. The fans exploded, chanting “Glorious 10," as they saw where this was going. Roode said he hasn't made very many friends, but he needs the perfect partner for the tournament. Roode asked him to think about it since Dillinger was so close to Dusty Rhodes. Roode said it would be Perfectly Glorious, stuck his hand out, and Dillinger accepted! Hideo Itami was asked about his match later in the night against Lince Dorado. Itami said Dorado is a great fighter and has great heart, unlike Austin Aries. He called Aries a baby and a coward, saying he may need to put him to sleep again. The match between NXT Tag Team Champions The Revival and The Ealy Brothers never got started, as Samoa Joe stormed past The Revival and destroyed the twins by himself. Joe took the mic and said the beatings will continue until William Regal's decisiveness improves. In case you forgot, he is demanding either an immediate rematch with the injured NXT Champion Shinsuke Nakamura or for Mr. Regal to strip Nakamura of the championship and award it to Joe. Dan Matha is coming next week. Picture a bald Curt Hawkins' head on Mason Ryan's body. Even then I think Matha is more ripped. Rose is from Tough Enough and is Corey Graves' newest crush. The biggest positive of Eva Marie being called up was that Graves would stop acting like a 30-year-old Jerry Lawler, then we got Mandy Rose. Rose punched Moon in the face, so Moon replied with some very hard kicks and a springboard crossbody. Rose did shake it off and hit a really nice bicycle knee to the face. Moon picked up the win with the top rope stunner. Johnny Gargano and Tommaso Ciampa felt good about sending The Revival running away at the CWC live finale, but they have a checklist that needs to be finalized. They want to win the Dusty Rhodes Classic, since that is how they got into NXT last year. Also on the list is beating The Revival and winning the NXT Tag Team Championship. Sanity is coming. That's good news. It's time for Akam and Rezar! Jesus Yurnett needed Jesus as The AoP just destroyed him and his partner. Rezar heaved Cruise out of the ring and pinned Yurnett with the side Russian legsweep/clothesline combo. Regal had no update to give everyone regarding Nakamura's health. He was about to talk about the teams in the Dusty Rhodes Classic (despite saying earlier he was going to later this week) when Blake and Murphy came in and began arguing with each other over whether or not they were a team again. Regal sent them on their way and that was that. 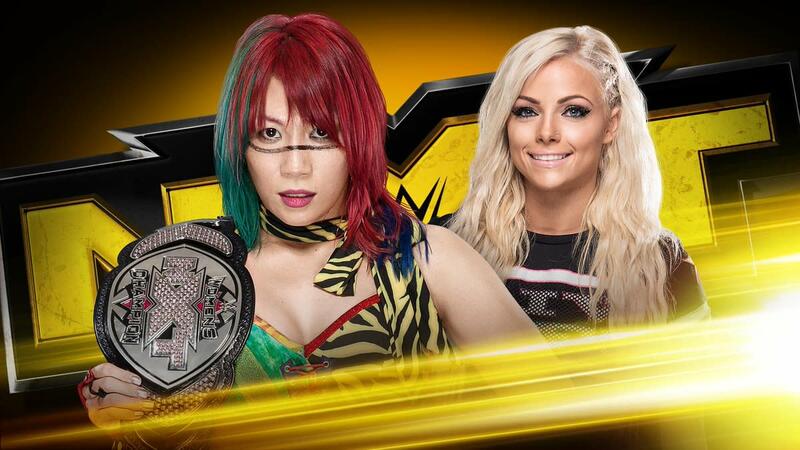 Liv Morgan has been running her mouth the last few weeks and now Asuka is here to shut her up. After a dropkick from Morgan, Asuka took her down right away and made her tap out in the shortest match of the night. After the match, Asuka declared that nobody is ready for her. Next week: Cedric Alexander & Andrade "Cien" Almas vs. The Revival in a Dusty Rhodes Classic match. This was a very good match, and Itami continues his streak of solid matches since he came back from injury. Dorado looked really good here as well. This match was a perfect blend of the two men's respective styles. At one point, Itami hit a top rope clothesline from more than halfway across the ring. Later, Itami teased the Go To Sleep and then held his fingers an inch apart. Dorado missed a picture perfect shooting star press, and Itami hit the Yakuza kick and corner dropkick before hitting the GTS for the win! Itami was celebrating his win when Aries ran in and attacked him. It took six weeks, but Aries is finally on the attack after Brooklyn! Itami reversed an Irish whip, and Aries grabbed the ropes and ran away again. That does it for this week. Will Aries ever step up and face Itami? Will we find out next week? Only one way to know for sure, and until then remember to say your vitamins and take your prayers!